Very nice. But size is smaller than you’d think a king should be. It is,shown as a bedcover...not a quilt, but is more quilt size. I do have wooden sides so it’s not an issue. The Curated Nomad Natoma Coverlet Set provides all the elements of a unique, casual look for your bedroom. The rich coral color is accentuated with dark quilting featuring adorable elephants and flowers. The reverse side is a lighter off white color while the quilting remains dark colored for a completely different look on the reverse. 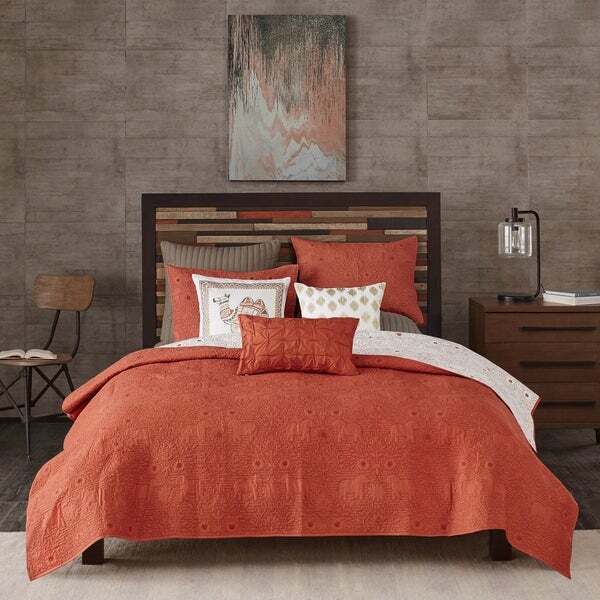 Whether you are using this coverlet as a layering piece to your current set or as a focal piece all on its own, the Natoma collection is sure to be a hit in your space. I was unsure of the actual color, since it said coral. It is more of a burnt orange (brown orange not pink orange) which is the exact color I wanted. I have it on the reverse side, showing the off white and the elephants are lined in the orange. It matches my one accent wall perfectly! The fabric is soft and it is lightweight... perfect for California summers! Oh My!! This reversible cotton quilt comes with matching pillow shams too! I was so delighted to realize the high quality of this 'work of art'. It is a perfect beneath my bedspread ( which I can now keep turned down) and you will love the added bit of 'weight' that a cotton quilt provides - like a bit of sleep therapy! Lovely quilt stitching in an elephant design is used in contrasting color thread. Its not often one finds this quality workmanship in a quilt with two matching shams for this price! Thank You Overstock! This coverlet set is just was I've been searching for. I had several criteria that needed to be met for a new spread for our bedroom. It needed to be red-orange in color, all cotton, and not too heavy. This set meets them all. I am so pleased. 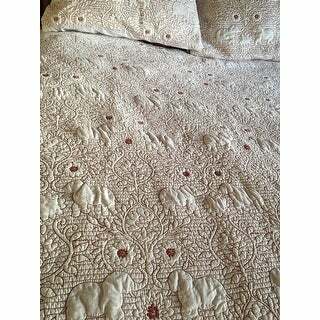 The coverlet set is soft and the quilted stitching is just beautiful. This is a quality product at a good price; however it does NOT fit. It is too long and not wide enough. Both shams &amp; coverlet are reversible and I use the cream side. Just very Beautiful! Love the elephants! This sweet quilt endears itself and its little elephant images to your heart immediately. The color is very accurate online. From the images online, I had imagined the quilting thread to be a little darker than the surrounding fabric, but they are very well matched. This means the repeating image is not overpowering and the overall impression of the quilt is a solid color, instead of a busy print. Depends on what you are looking for, I understand, but I wanted it to be primarily the smooth rust color, which I am happy about. The color was right on. Love the elephants, however I have had to work hard to keep this pretty jewel. The size is very awkward. Because I read the reviews before I ordered I took the suggestion and ordered a king for a queen. It still did not cover the box springs at the foot of the bed so my husband and I set out to build a footboard after buying 5" risers to accommodate the sides. It is now quite exquisite. Shewww! What a project. I thought I would like this quilt in my master bedroom. The color wasn’t right but it was perfect for my guest bedroom. I currently have it with the cream color side up. I love the little elephants. I've own this set for over a year. 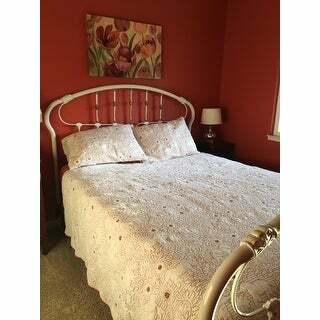 Its a soft cotton and very well made quilt set. I've washed it and put it in the dryer many times and it hasn't shrink or faded. I also purshased the yellow and white set. I highly recommend this set. This coverlet is beautiful the color matches with My curtains. Looks fabulous, just like the photo. Nice summer weight - all cotton. Stitching is done well. Color is true to picture. Overall very happy for guest room redo. I love the coverlet set. It is very good quality and very well made. I like the fact its reversible. Thanks overstock. This is a beautiful Bedspread, with a wonderful West Indian motif design. Very striking. Great color, wish it was a little softer, it does have a nice weight. "Do you have the euro shams that are shown with the set?" Unfortunately no, the euro shams are not available. "Want to purchase Entire set a shown. Want Throw Pillows, Head Board and picture"
You might can look for the other peices but it is offered as a three piece set. I bought mine for my Tiffin motor home and it looks great. I wanted an all cotton lightweight quilt. The one reviewer who contributed a meaningful review said this was lightweight. And I liked the color. Love the color and details of this coverlet. I was looking for a lightweight quilt with an Indian style motif and the color was right. "What are the dimensions of the queen. It shows the cal king dimensions on the web site." The full/queen dimensions are approximately 92" inches long x 88" inches wide. "Can I buy the decorative pillows that are displayed with this quilt?" Unfortunately, the decorative pillows shown are not currently offered within our inventory. We apologize for any inconvience.